The night approaches quickly. A harbor seal plunges into the water, diving deep as the sunlight recedes. Through the dark, turbid waters, she searches for fish. Suddenly, the whiskers on her right cheek begin vibrating. And she’s off. Like many other animals, seals can use their whiskers to touch objects to determine their size, shape, and distance away. But the fish that our seal set out to catch hadn’t touched her whiskers. 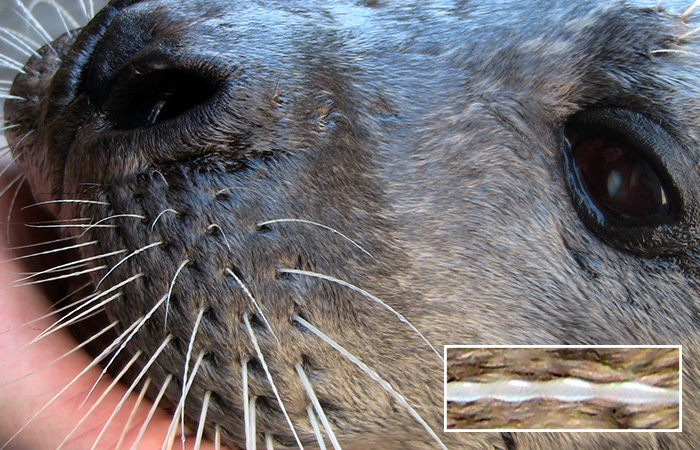 Could seals also use their whiskers to “feel” the surrounding water patterns to track fish that swim by? In the early 2000s, marine biologists at the University of Rostock in Germany began to explore that theory. They conducted experiments in which they placed a blindfold and earmuffs on a seal. The animal nonetheless was able not only to detect the presence of moving objects, but also to track them long after any visible traces of their passage had disappeared. It became increasingly clear to the researchers that seals have an uncanny ability to use even the faintest signals in the water to paint a picture of their dark, watery surroundings. This finding intrigued engineers in my research group on the other side of the Atlantic in the Towing Tank Laboratory at the Massachusetts Institute of Technology. Could we learn a few tricks from seals to overcome the challenges we face in designing underwater vehicles with better navigation and sensing capabilities? When news of the Rostock seal biologists’ work reached our research group, it stimulated new thinking about two main lines of inquiry we were pursuing. The first concerns vibrations in large offshore structures such as oil drilling platforms. The steady flow of currents around these structures induces significant, prolonged vibrations that lead to structural fatigue. For the past three decades, my Ph.D. advisor, Professor Michael Triantafyllou, has led studies uncovering the basic physics of flow around riser legs and cables in offshore structures and, more fundamentally, around circular cylinders. Our group has also pioneered the field of marine biomimetics: the science of using features observed in nature to inform the design of new marine technologies. 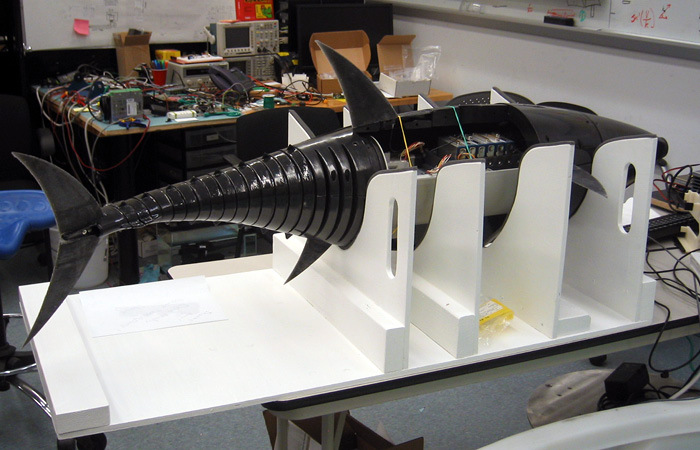 One example is RoboTuna, an underwater vehicle our lab developed that employs motions observed in efficiently swimming fish. 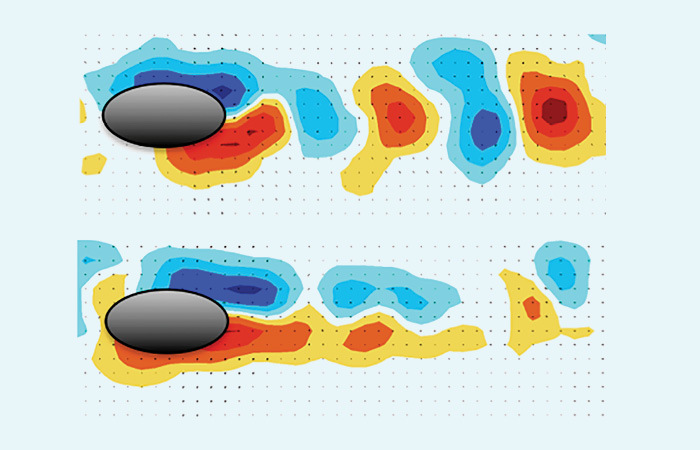 This research not only allowed us to design improved underwater propulsion systems, it also enabled us to uncover some fundamental physics of fish swimming that we wouldn’t have been able to obtain through observation alone. We jumped at the opportunity to combine our interests in vibrations and bio-inspired design and pursue research on seal whiskers. We had two goals in mind: The first was to uncover how the basic physics of fluid flow around cylindrical structures—seals’ whiskers—enables them to sense their environment. The second was to use what we discovered to engineer a new technology: a flow sensor that can track a fading hydrodynamic trail. Such a sensor installed on autonomous underwater vehicles (AUVs) would improve the vehicles’ ability to navigate. Rather than relying as they do now just on reflected sound waves—listening like a bat to calculate their positions and detect objects—the vehicles could use another sensor to “feel” their way to moving objects. 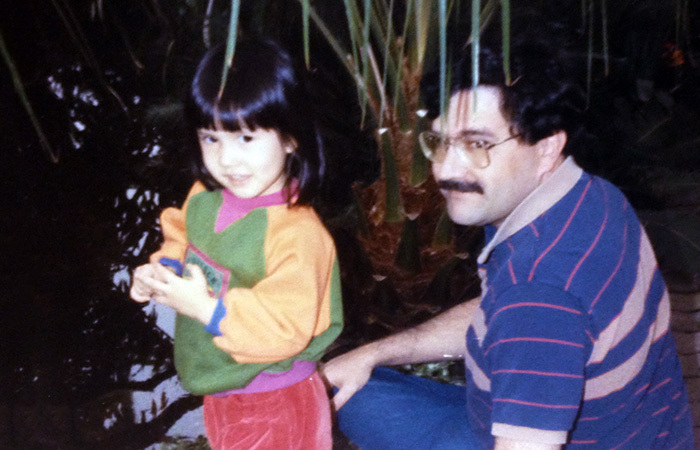 My dad is an aquatic biologist, and when I was younger, he took my siblings and me tromping through streams to collect water samples for testing. I was excited to be surrounded by the natural world, with all of my senses heightened. The fresh air, the crisp water around my legs, and the slimy rocks were all pointing to the myriad unknowns out there to be discovered. As time went on, I began learning about many things happening in nature that at first glance didn’t seem possible: a blind fish called the Mexican tetra, for example, that somehow can navigate through caves, or sea turtles that traverse thousands of miles across the open ocean to reach their nesting sites with pinpoint accuracy. The same curiosity to find new critters underneath the rocks my dad turned over stands at the heart of my work now. It compels me to discover phenomena in nature that engineers can learn from—such as the mechanisms seals evolved to locate the “footprints” fish leave behind in water. Each flick of a fish’s fins causes water to form a swirling mass known as a vortex that lasts for many seconds after the fish has gone. That seals can sense these tracks with their whiskers is surprising because, as our research group knows well, cylindrical objects such as whiskers should naturally vibrate in flowing water. So how is it possible for swimming seals to notice vibrations in their whiskers caused by the fish tracks if their whiskers are already vibrating a lot on their own? 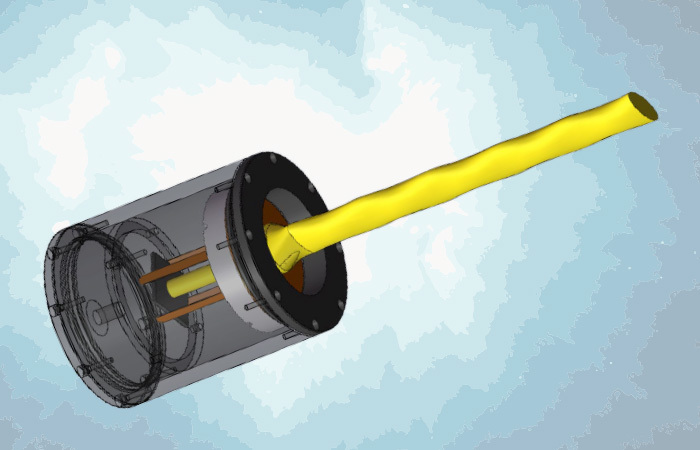 Fluid usually doesn’t flow smoothly around cylindrical objects. 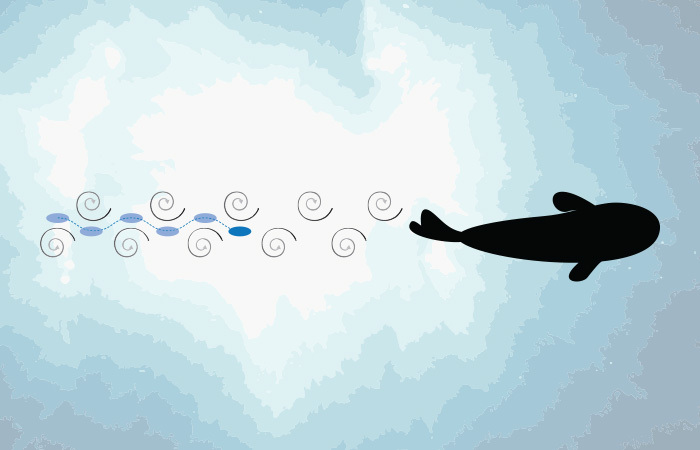 Instead, the flow breaks away from the object into vortices, similar to those made by fish. Each vortex is swirling fast. According to the Bernoulli equation (which can also help explain how airplanes stay aloft), each vortex is therefore a region with low pressure, or suction. As a vortex sheds away from an object, it essentially pulls the object toward it, and it keeps pulling until the vortex spins far enough away. 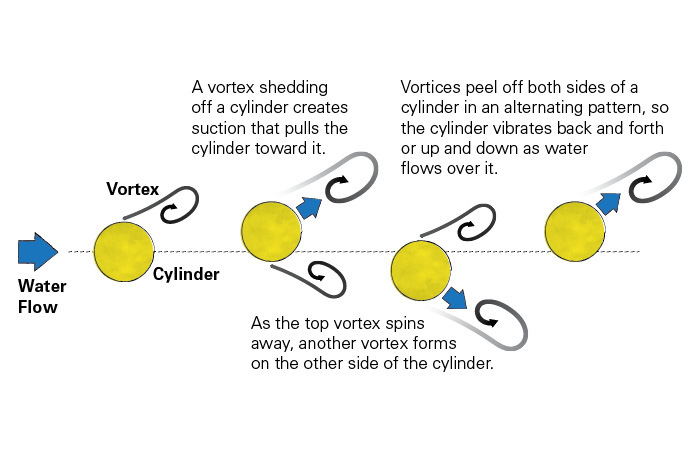 Because the vortices peel off both sides of a cylinder in an alternating pattern, they exert suction on both sides of the cylinder. As a result, the cylinder vibrates back and forth or up and down (depending on whether the cylinder is oriented vertically or horizontally) as water flows over it. This can happen with an amplitude as high as the diameter of the object itself. For the same reason, your car radio antenna may shake as you drive, and offshore platforms can sway in even the slightest ocean currents. Theoretically, whiskers should also vibrate as the seal swims. 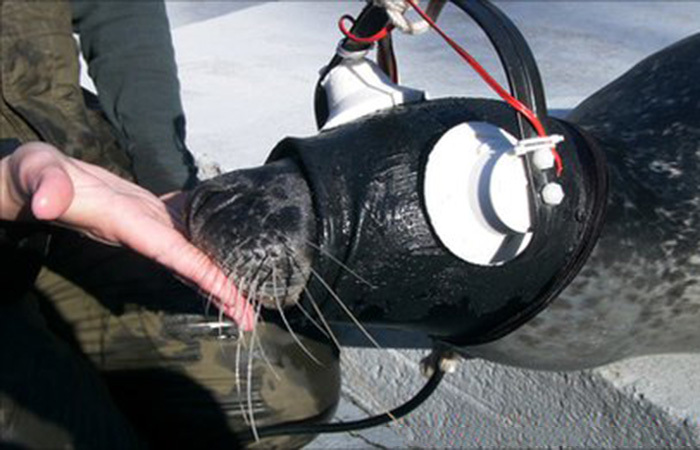 To explore this question, the biologists in Rostock mounted a camera to one of their harbor seal’s heads. They got a close-up view of the whiskers and made a key observation: When the seal was swimming forward, the animal’s whiskers did not appear to vibrate, as most cylindrical objects do. The scientists theorized that this was related the seal whiskers’ unusual shape. Viewed from their tips, they aren’t circular, but elliptical. And the side edges of the whiskers aren’t straight, but wavy. Intrigued by their observation, I began to conduct experiments of my own. 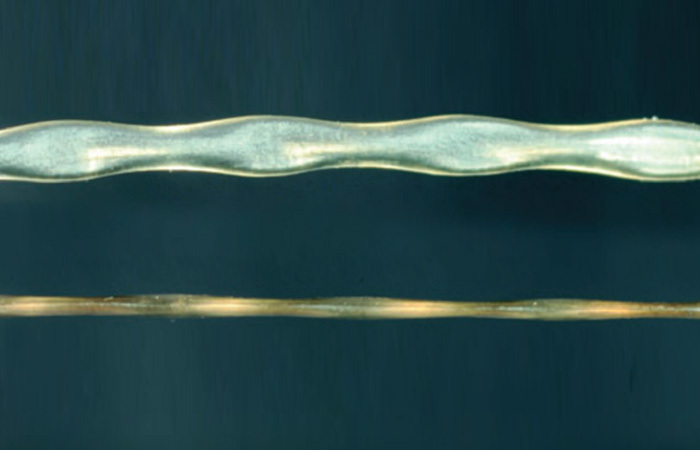 I built a hollow plastic replica of a harbor seal whisker that was precisely shaped but 50 times larger than a real whisker. 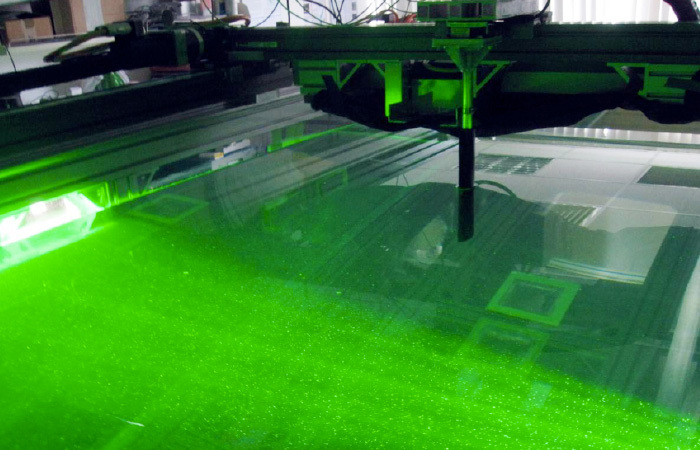 We used a process called stereolithography, which employs a computer-controlled laser to draw the three-dimensional shape of the whisker on a liquid polymer. The polymer hardens on contact with the laser. 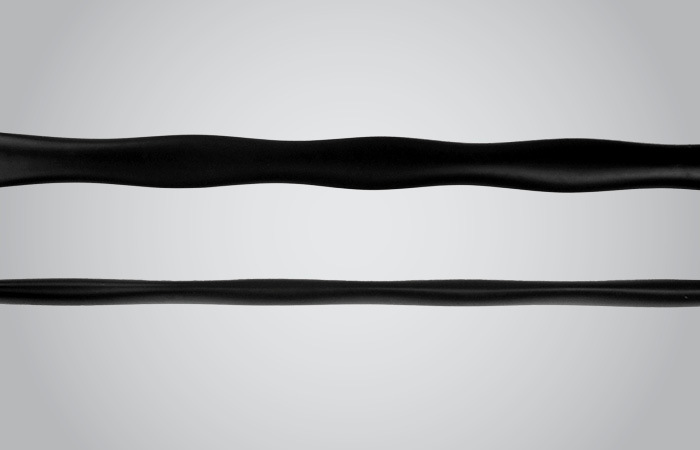 The scaled-up whisker made it easier to measure how it vibrated in experiments. I submerged the model whisker in our two-meter-long water tank. It was mounted to a set of motors programmed to tow it at a constant speed down the tank’s length and impose a variety of vibrations. A sensor attached to the whisker measured the forces it felt. Some calculations from the measurements confirmed that the whisker’s distinctive shape indeed allows it to avoid the natural vibrations that circular cylinders experience. I also used a technique called Particle Image Velocimetry to visualize the vortices that form behind the whisker. We add tiny particles (micrometer-size plastic spheres) that are transported along with the fluid flow. A laser illuminates the particles, and a camera captures the patterns they form, allowing us to map the fluid dynamics. The images showed that the whisker reacted quite differently than circular cylinders. Rather than shedding big, coherent vortices from top and bottom in an alternating pattern, it shed vortices that jumbled up behind it. As a result, the overall suction forces exerted by the vortices on the whisker were much weaker, causing the whisker to vibrate less. 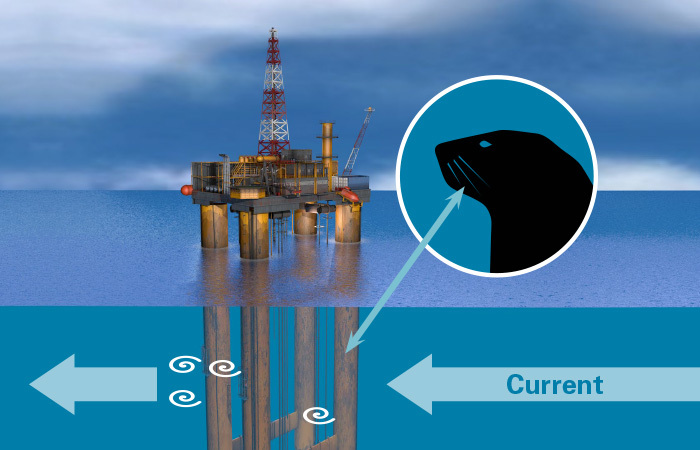 Nature appears to have refined the seal whisker shape to avoid the vibrations that have frustrated offshore engineers for decades. Perhaps incorporating a wavy “whiskerlike” form into the design of riser legs can reduce structural fatigue. We postulated that because a whisker doesn’t vibrate when the seal swims, it will start to vibrate when it encounters a disturbance in the flow from wakes trailing behind prey. Armed with this hypothesis, I began to design a whisker-inspired sensor to test how it responds to a hydrodynamic trail. First, I designed an apparatus that incorporates the whisker’s distinctive geometry and allows the “whisker” to move freely at the base it is attached to, as it does in the seal’s cheek. Then I devised a setup that simplistically represented what the whiskers experience when they are following a fish trail. 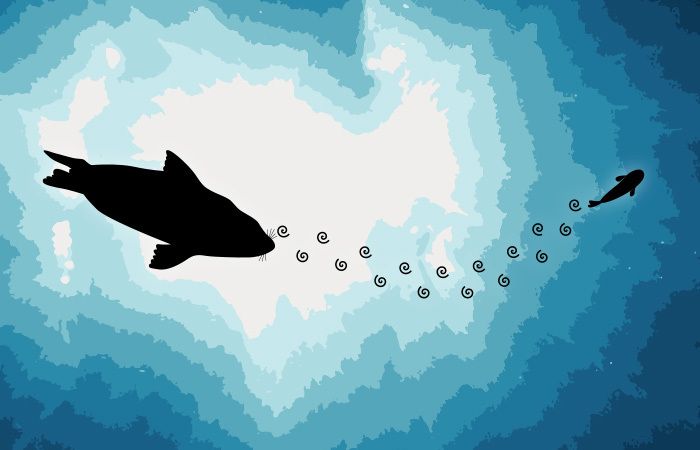 I placed a large cylinder upstream of the whisker to generate a hydrodynamic trail similar in some ways to a fish wake. Red dye dripped into the tank to colorize the vortices behind the “fish.” With strain gauges, I could measure the whisker’s vibrations while it was towed behind the fish. The measurments showed that as the whisker encountered wakes, it quickly began to vibrate with large amplitude. It moved up and down, perfectly over and under and in between the oncoming red-colored vortices, like a slaloming skier. Similar motions have been observed with fish swimming through vortex wakes. We know that this “slaloming” allows the downstream object to extract energy from the wake. In the seal’s case, this means that its whiskers will strongly vibrate in the presence of a vortex wake. 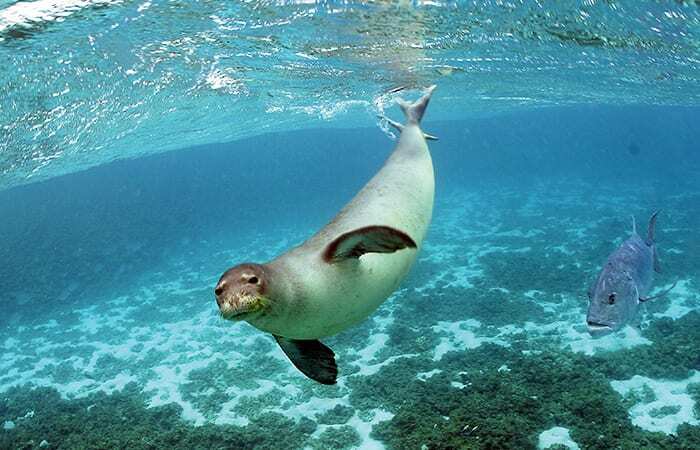 And based on how much and how fast the whiskers vibrate, the seal can not only detect such wakes but also estimate how big the source of the wake is. There’s much work to be done to perfect such a whisker sensor, but the potential exists to enable AUVs to assess their surroundings by feel as well as by sound. 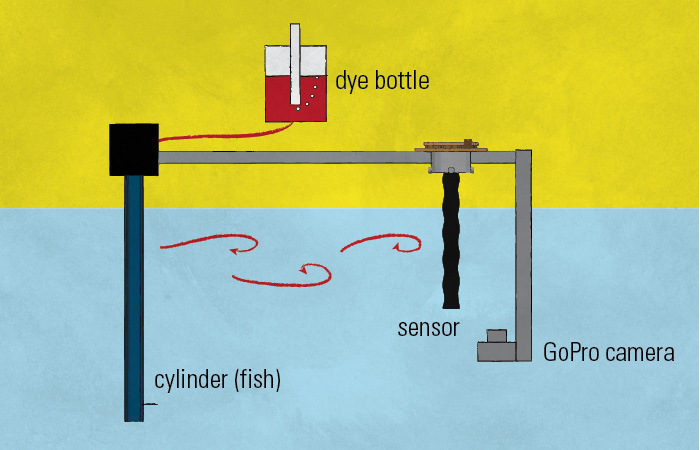 One day, fishermen may be able to use this—not only to detect the presence of fish under their boats, but also to track the trails of fish swimming past. And scientists may be able to search for hydrothermal vents on the seafloor by sensing far-off ripples from fluids flowing out of vent chimneys. Hungry seals will keep their whiskers ready to search out the tiny clues that lead to food. And I’ll keep flipping over rocks to find other useful lessons from nature, waiting to be uncovered. This research was funded by the Office of Naval Research, the W. I. Koch Chair in Marine Technology, the MIT Sea Grant Program, and the Singapore National Research Foundation via the Singapore-MIT Alliance for Research and Technology: Center for Environmental Sensing and Modeling.